DESCRIPTION Collection of 12 assorted butterflies from the Ithomiinae butterfly tribe in the nymphalid subfamily Danainae. 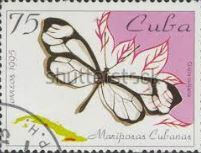 They are neotropical butterflies with over 300 assorted species. The caterpillars eat a poisonous food plant which renders the adult unpalatable to predators.